An original letter of correspondence between brothers and business partners Sydney Octavius Chase and Joshua Coffin Chase. 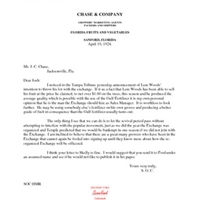 Topics discussed in the letter include the Lem Woods' intention to partner with the Florida Citrus Exchange and how to respond to the revival of the Exchange. Original letter from Sydney Octavius Chase to Joshua Coffin Chase, April 19, 1924: Chase Collection (MS 14), box 7, folder 14.11, Special and Area Studies Collections, George A. Smathers Libraries, University of Florida, Gainesville, Florida. Digital reproduction of original letter from Sydney Octavius Chase to Joshua Coffin Chase, April 19, 1924. I noticed in the Tampa Tribune yesterday announcement of Lem Woods’ intention to throw his lot with the exchange. If it us a fact that Lem Woods has been able to sell his fruit at the price he claimed, to net over $1.00 on the trees, this season and he produced the average quality which is possible with the use of the Gulf Fertilizer it is my own personal opinion that he is the man the Exchange should hire as Sales Manager. It is worthless to look further. He may be using somebody else’s fertilizer on his own groves and producing a better grade of fruit in consequence than the Gulf fertilizer usually turns out. The only thing I see that we can do is to let the revival period pass without attempting to interfere with the popular movement, just as we did the year the Exchange was organized and Temple predicted that we would be bankrupt in one season if we did not join with the Exchange. I am inclined to believe that there are a great many growers who have been in the Exchange that cannot again be fooled into signing up until they know more about how the re¬organized Exchange will be officered. I think your letter to Skelly is fine. I would suggest that you send it to Ford under an assumed name and see if he would not like to publish it in his paper. Chase, Sydney Octavius. 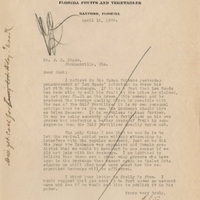 “Letter from Sydney Octavius Chase to Joshua Coffin Chase (April 19, 1924).” RICHES of Central Florida accessed April 22, 2019, https://richesmi.cah.ucf.edu/omeka/items/show/1596.